I decided against bringing over my level 80 Warrior to Rexxar, so essentially I will be starting over with my Goblin Hunter. I'm actually pretty happy about that, there's something about starting from nothing and working your way up. No heirloom items, no crafted stuff from friends and not even any started gold. Well, it's time I get started. The starting Goblin zone was a lot of fun. Sure it was cheesy... but that's what Goblins are like. The use of phasing was great, it felt a lot more immersive that the normal quest system. The new Warchief even game me a present, Gobber the mobile banker. Only has a half-hour cooldown too. Thanks! I picked up my tradeskills, Mining and Engineering. I've always been a fan of mining... probably the Dwarf in me. It should help with Engineering and bring in some gold. As for Engineering, it lets me make fun toys and scopes. 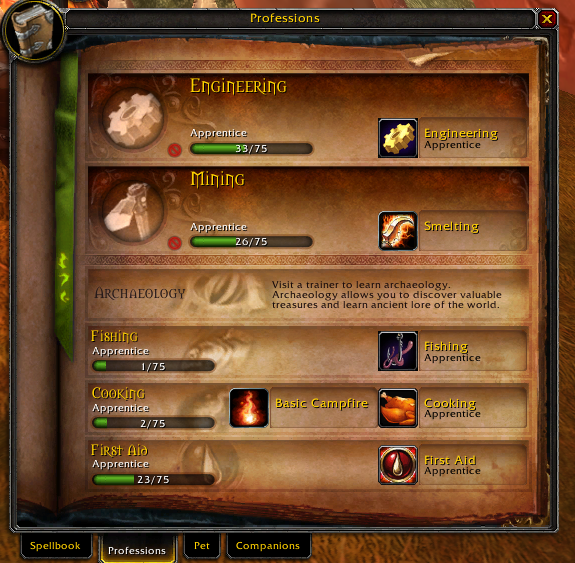 By the way, the new profession screen is pretty slick. Expansions are a great time to level new gathering skills, since others are creating characters which will need them. I was a bit broke but flush with copper, so I sold off 2 stacks for 6 gold each. Gold problem, solved. Next item on my agenda is getting more inventory space. I bought a the Mining Bag, since I do love to hoard crafting materials. I know I could use my new pet banker for storage, but where's the fun in that? I also reached Revered with the Bilgewater Cartel. They happened to have a nice 16 slot bag available, so I picked up one of those too. I figure I'll replace the 2 smaller bags I have as I go. I should be all set to do some serious (well, not so much) questing.